Pumpkin Flavored Instant Pudding & Pie Filling Jell-O Instant Pudding & Pie Filling, Pumpkin flavor, makes an amazing dessert. Its rich flavor and creamy texture will make you miss your grandma's homemade pudding. Make it as a party dessert and brace yourself for the surprise, a dessert so easy to make yet so delicious to eat, your guests will love it! Quick, Easy and Delicious! 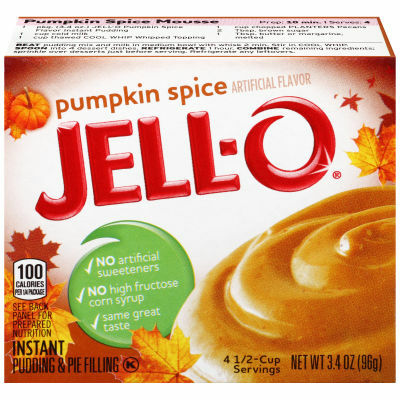 Jell-O Pumpkin Flavored Instant Pudding mix can be used to prepare pumpkin spice poke cake, mousse, cupcake-topping and pie filling. Its taste and texture is bound to make your taste buds crave for more. Both, kids and adults love its indulgent pumpkin spice flavor and luscious creamy texture! Moms' favorite because it does not require a lot of time and effort to prepare. Hence, all- time favorite dessert and snack!